We’ll be in unfamiliar territory in more ways than one when the boys run out to play their final 2017 game against Ajax at Princes Park in Caufield South tomorrow, but they are up for the challenge. 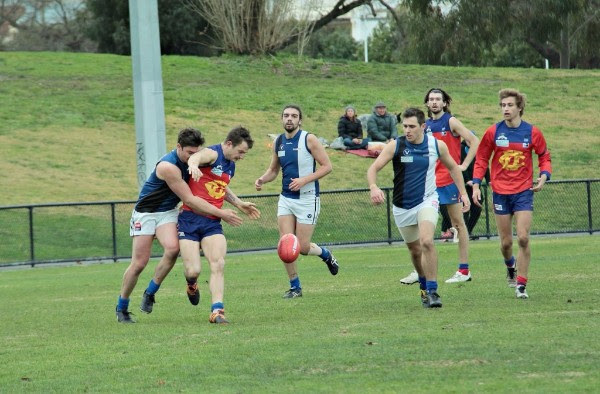 Fitzroy has one last crack to stay in Premier B for season 2018 and Ajax will be desperate to try and take the last finals’ spot by finishing fourth. 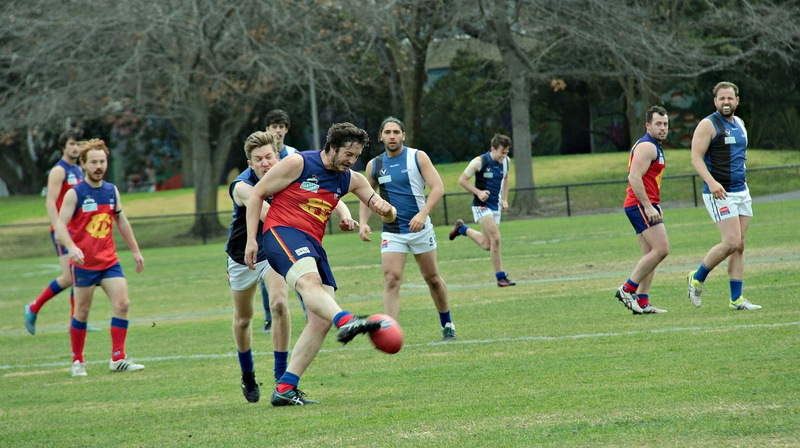 Last week Fitzroy lost the Norm Johnstone Trophy to the very switched-on Parkdale Vultures for the first time in five seasons and with it a chance to avoid relegation. The last chance comes this Saturday provided other games go our way. We need a big Fitzroy crowd to head out and get behind the boys as they put an almighty effort into getting over the line. We are Fitzroy – are you in the frame? 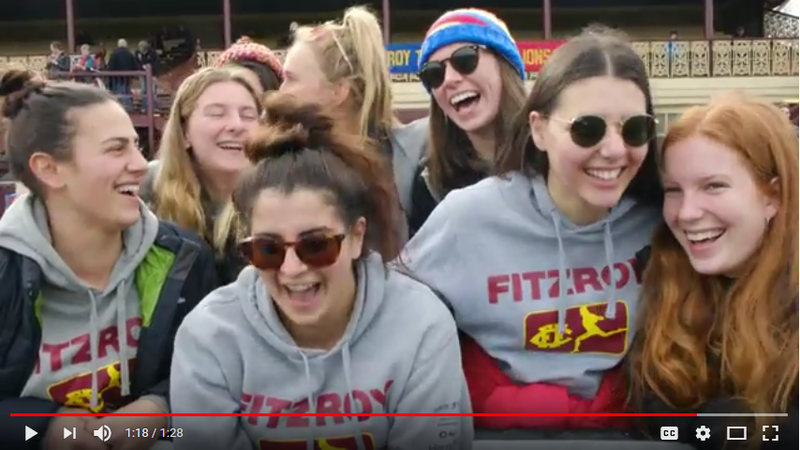 From the regular faces on Hipster Hill to legends of the club, current players and our close-knit Fitzroy community; they all feature in the club’s new video showcasing the essence of our club. The video is an integral part of a funding bid the club recently submitted. We took the opportunity of the funding submission to make a video which will be a key plank in targeting new sponsors, potential players, volunteers and Fitzroy locals to come on board in 2018. Tagged with the rallying call of lifetime Fitzroy fan and club timekeeper, Suzanne Madeley: Fitzroy forever, forever Fitzroy, the video is the fantastic work of producer Paul Burston, with the dulcet tones of Coodabeen Champions’ legend Jeff Richardson doing the voiceover. Thanks to Paul and Jeff who donated their time and expertise to the club and Fitzroy Director, Gabrielle Murphy, who coordinated and oversaw the production. 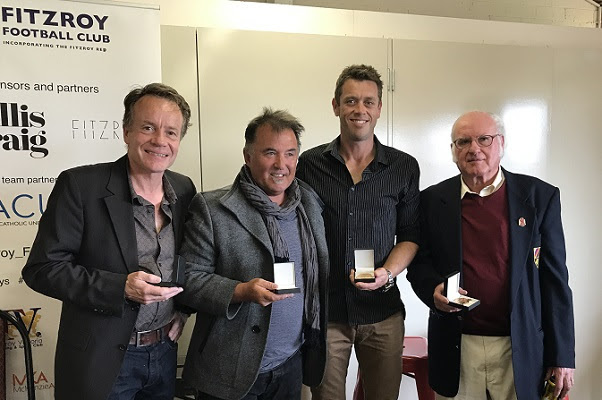 Reds and Fitzroy stalwarts and legends came together on Saturday as the club presented its VAFA medallions to the four greatest contributors to the club since the VAFA centenary. The club presented the VAFA 125 Medallions to Graham Bergen, Steve Drury, Bill Atherton and Lloyd Browne last week at the FitzroyIT game and in return the packed house at lunch were treated to some fantastic stories of the good times with the Reds. What goes on at lunch stays at lunch, but let’s just say it’s luck Sam Buckley is overseas. Everyone from our local politicians (of a variety of persuasions and allegiances) to kids, grand kids, life members, former Fitzroy and Reds players and a few drop-ins enjoyed a great afternoon. Thank you to our awardees for attending on what was a great day with friends and family and to interviewers Peter Hille and Anita Roper for encouraging the great storytelling. 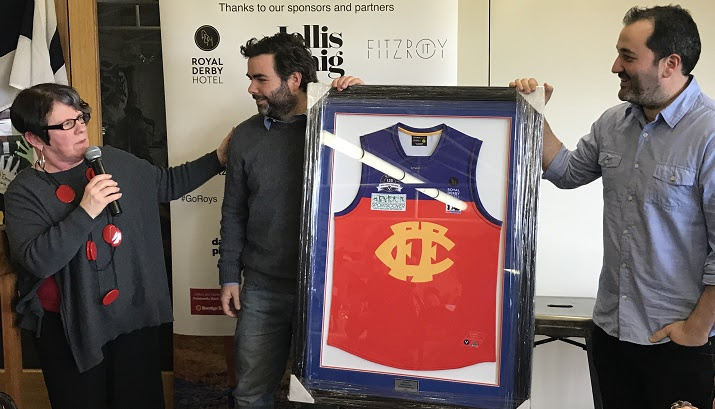 FitzroyIT accepted a framed club jumper from Fitzroy President, Joan Eddy, who lauded their work on our website. The FitzroyIT team, led by Tim Jenkinson and Justin Kelly, had two tables at the lunch of staff and clients and all seemed to enjoy the day. 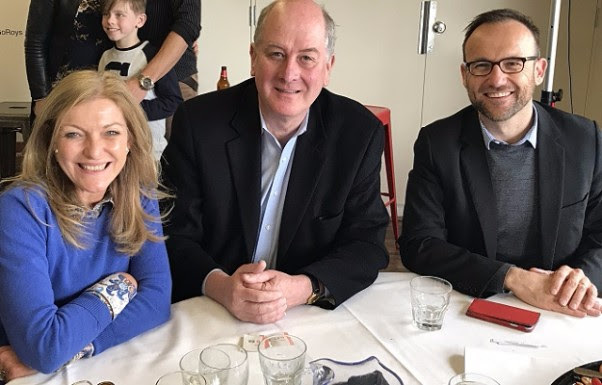 A huge thanks to all our regular guests and anyone who has attended one of Fitzroy’s pre-game lunches throughout the year – between the Premier, Kaitlyn Ashmore, Angela Pippos, the Serafini Brothers, Fiona Patten, our own Gemma Minuz and more, there has been fantastic entertainment, some important topics covered and many community connections made. Pictured above: Steve and Bernie Drury (Bernie played for Fitzroy in the 60s); and Fitzroy President Joan Eddy awards the FitzroyIT team with their framed Fitzroy jumper. 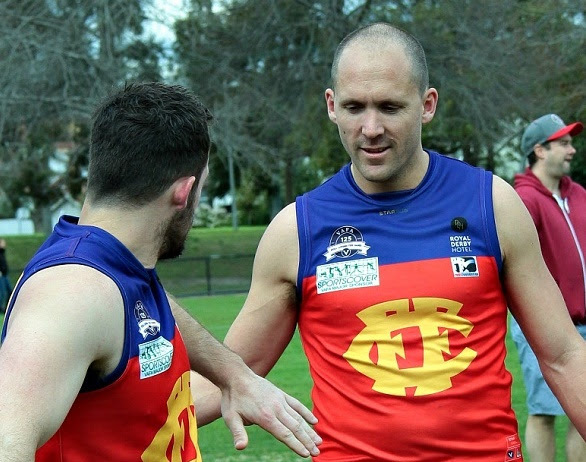 In a week when favourite sons were welcomed back off field, former AFL Premiership Player and former Roy Boy, Luke Ablett, pulled on the boots and ran back onto Brunswick Street Oval for his first game of the season. 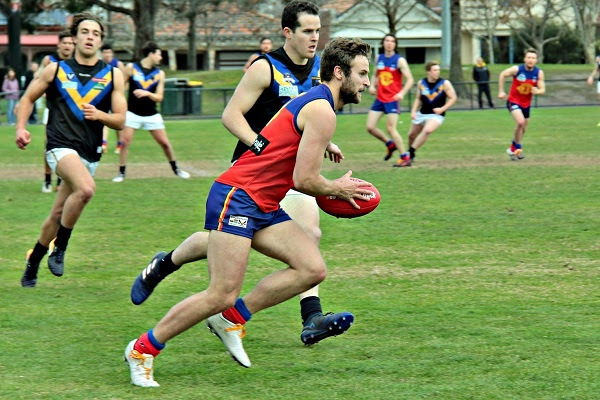 After announcing his own return via Twitter during the week, Ablett started up forward, kicked the first goal and proved a more-than-handy extra touch of class, to help the Reserves over the line against Parkdale. Ablett and Ashley Moloney shared the spoils up forward with four goals each, as Fitzroy posted its first win since Round 11 with the final score 15.9.99 to 10.4.64. The best players were Martin Deasey, Olmo Salvatore, Owen Symington and Mitch Bottomley. 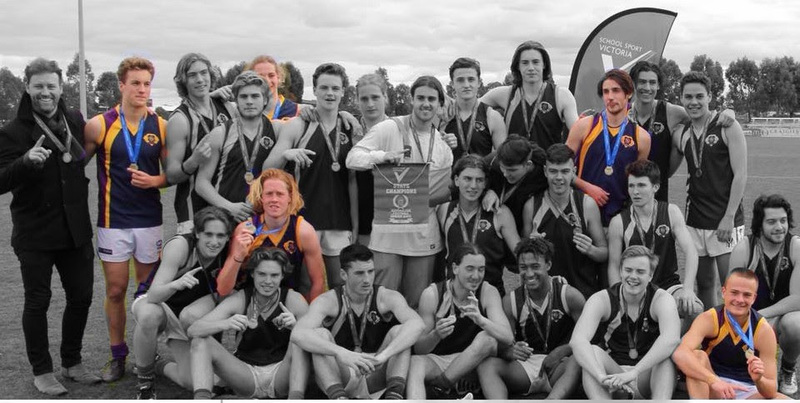 Congratulations to some of our up and coming senior players and Under 19s, Ted and Bill Clayton, Noah Wright, Oscar Sutcliffe and Elijah Messenger, who were part of the Northcote High School team which won the Australian Football Senior Boys State Final on Tuesday. Northcote High School defeated McKinnon Secondary College 8.11.59 to 4.5.29. 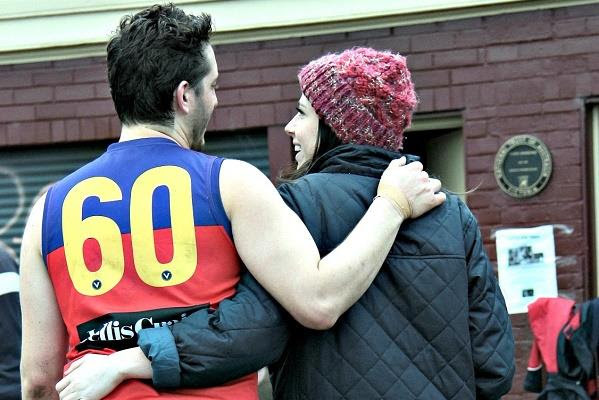 Jonathan Anderson – Jono to everyone but his fond parents who’ve never been known to call him anything but his full name – has just notched up his 100th game for Fitzroy. It’s the club he’s played with since he was a younger and leaner player, cutting up the wing on successive teams he’s played in from the mid-2000s till today. During this long journey, Jono’s experienced premiership success other footballers can only dream of. 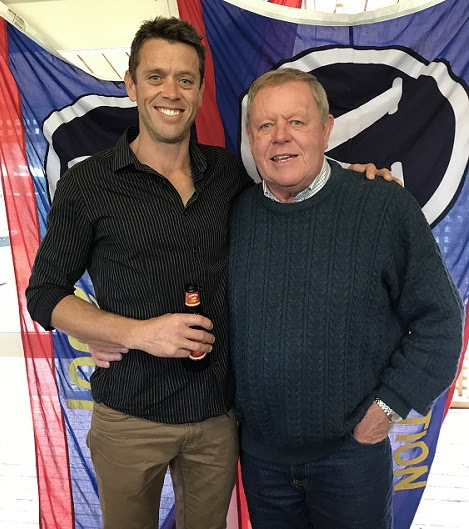 He was an influential player (with Julian Turner) in the Fitzroy Junior Football Club (FJFC) U12 Green premiership side coached by much loved and much missed John Dunton in 2003, the FJFC Colts 1 side under Michael Pickering in 2007, and Tim Bell’s Fitzroy FC U19 premiers who prevailed against Werribee in 2010. Then, as Jono says in characteristic self-deprecating style, “I took three years off and got a bit fat.” In doing so, Jono doesn’t even come close to providing a portrait worthy of what he means to Fitzroy and how we’d want to recognise him on the impressive achievement of his milestone. But seriously, like all of us who’ve been privileged to see him performing on the field for more years than we’d like to admit, we’d prefer to talk about Jono’s football prowess. “On the field Jono is a fierce competitor,” says Jack. “I rarely see him lose a contest and as a fellow backman he's saved me from embarrassment on untold occasions. “I think the vibe at the club is really good right now,” Jono says. “Despite our challenges on the field, I know first-hand that the Ressies are really enjoying our footy together and having a great time. As for all of us, it’s awesome to see such a good player and good bloke stick with us over the years. We join Jack Atkinson is wishing you sincere congratulations, JonJon. 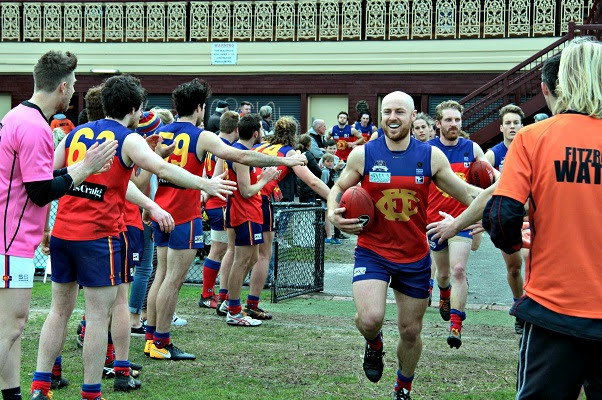 Pictured: Jono receives the congratulations of his greatest fan; With characteristic determination, Jono gets his kick away in a tight contest (both photos courtesy of Phyllis Quealy); With jubilant team mates in the U19 premiership side under coach Tim Bell (photo supplied by Jack Atkinson). As we prepare to play our final game for 2017, Red Roy celebrates the feats of four fabulous footballers who reached the 50-game mark during the season. Congratulations Alexa Madden, Martin Deasey, Will Zaghis and Max Davie on your courage and loyalty to the club we hold so dear. We wish you and your team mates every success in achieving our goal of premiers we’ll be [next] year! 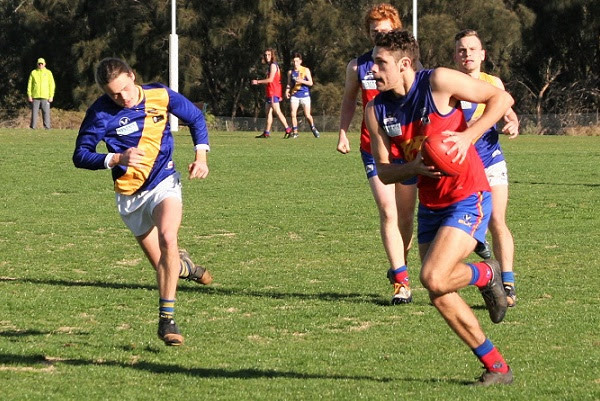 The season has come to an end for the Under 19s, with the Under 19 (1) team defeating Uni Blacks by 28 points and Under 19 (2) going down to third-placed Oakleigh by 58 points. The second side were very competitive in the first half, going in at the main break with a 5 goal deficit, but were worn down in the second half by the stronger Krushers. 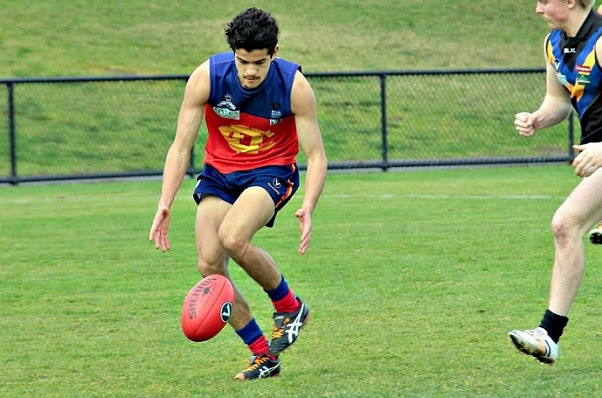 Among the best for Fitzroy were Jack Hart, Giovanni Colarossi, Liam O’Connor, Rhys Dolby, Viney and Declan Niere. It's been a difficult season for the second side, with numbers an issue most weeks and a couple of changes to grading to contend with as well. Full credit should go to Greg Coleman and Ken for the way they have handled the second side. The Under 19 (1) team started the season with a win against Uni Blacks, so it was a fitting to end the year, beating the same team at the same venue. he Blacks were very competitive and Fitzroy had to fight all the way, only pulling away in the second half to record a 28 point win. Oliver Read had a day out, kicking six goals, along with Rory Patterson (3), Josh Robinson (3, pictured) and Ed Harley with 2. Daniel Megennis, Oliver Read, Gus Richardson, Patterson, James Butler and Oscar Sutcliffe were all named among the best, in what was a very good team performance. Coach Time Bell said both Under 19 teams have struggled for wins this year, due to a lack of numbers and unavailability from time to time, however all involved should be proud of the way they fought the year out and represented the club with honour and respect. The club would like to thank all involved with the Under 19s, in particular the coaches and parents for helping to get the boys on the ground each week. 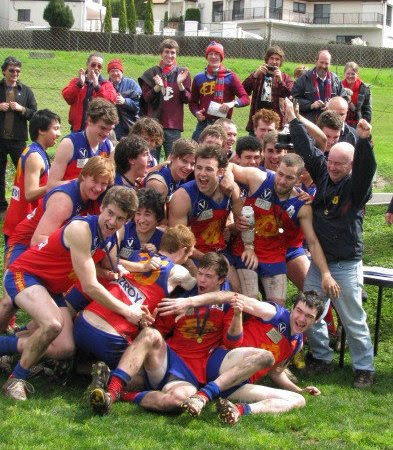 We certainly hope to see all of these young men running around in the Fitzroy jumper for many years to come. Thanks to David Miller also for the under 19 photos. Are you missing women’s footy since the Roy Girls hung up the boots for the season and the AFLW is between seasons? Well our friends over at The Footy Almanac and John Harms have the solution. The Women’s Footy Almanac 2017 is now available. 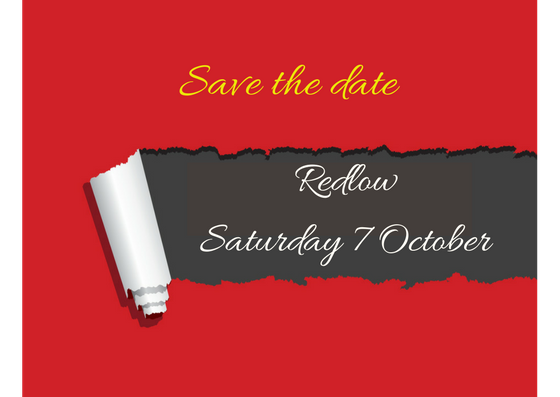 It is a celebration of the inaugural AFLW season. Compiled and edited by Stephanie Connell, John Harms and Yvette Wroby, it is a collection of essays by 40 different writers, which tell the story of this historic season. 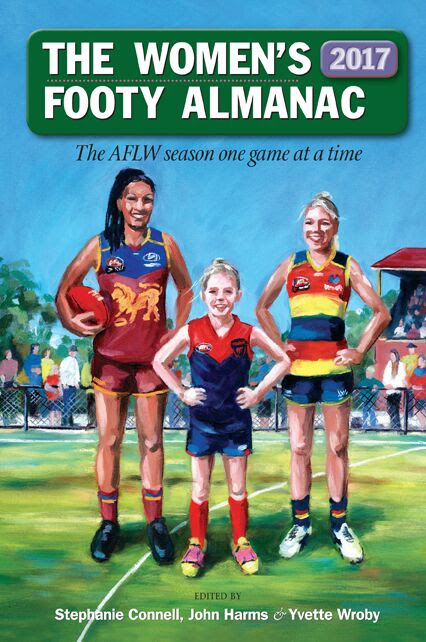 It features insightful and amusing reports of every AFLW game, penned by a diverse squad of writers from around Australia, exceptional Grand Final coverage, match details of each game and player profiles. You can order copies now for $25 which includes postage. Purchase via The Almanac Shop. Or contact them directly via email sales@footyalmanac.com.au to place an order. 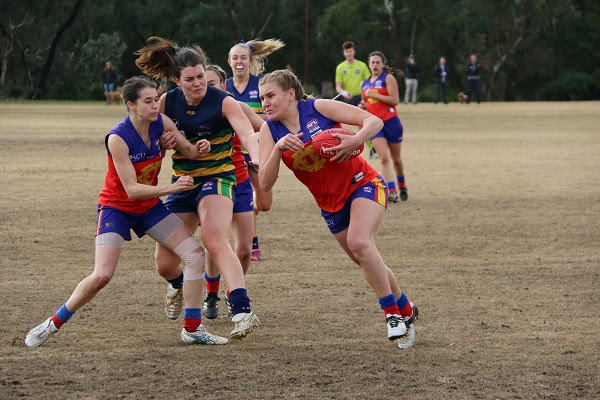 Please note change of venue for this week's games: the games will now be played at Princes Park Caulfield, Bambra Road, Caulfield (also known to Roys supporters as Old Haileybury's home ground).